Basement, by Planet Connections Theatre Festivity award-winning playwright Michael Hagins, is the maiden voyage of Roly Poly Productions. Janet Bentley directs, and co-producer Andy Cohen provides music and sound design. The cast features Alexandra Cohler, Anthony T. Goss and Ian Campbell Dunn. All these veteran theater people have put their prodigious energy into bringing us a play about anti-fascism and getting to know the other, whom it turns out we might like a whole lot if we give them a chance. Such themes strike me as quite timely, and will give you an hour and forty minutes of engrossing theater that just flies by (forgive the pun). As our story opens, Lt. Michael Crawler (Anthony T. Goss), a Tuskeegee Airman from the U S of A, is lying in bed, only just about to realize that he has been shot out of the sky. Jazz plays on the radio in the little basement bedroom. Soon, Michael meets his host, Katrine (Alexandra Cohler), a self-sufficient French maiden who has rescued him from disaster. They are in occupied France, in 1944. They do not speak each other’s language. The odds seem to be against them. Michael’s wounds are severe, and they must hide from passing German patrols, which leave Katrine bruised but not beaten. As time passes (to a jazz soundtrack which includes Billie Holiday, Lionel Hampton and Duke Ellington), Ian Campbell Dunn on Allied radio also keeps us appraised of the landings at Normandy. Anthony faces his pain, dares himself to do push-ups, and eventually feels ready to fight again. Katrine, who already had her radio to listen to, can understand Michael. Michael can now speak some French. Their struggle to understand each other has a nice pay-off: a strategic as well as a romantic partnership. Meanwhile, Michael dreams of going home to Harlem, but not the Harlem he left. He believes that his status as a war hero will give him access to the American Dream unfettered by racism. His ambition is inspiring to me at this historical moment. But will Michael ever get back? What will he find? And what would that mean for Katrine, who has never met anyone like him? If French is the language of love, it is all the more a pleasure to watch our protagonists take baby steps and then spread their wings. The charming process of getting to know each other is convincingly directed by Janet Bentley. Ironically, the solid and homey basement (set design by You-Shin Chen) is all that is left of Katrine’s house and her former life. 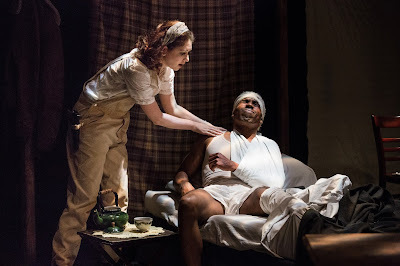 This play shows that, even in war time, you can rebuild from the bottom up. You can even do the lindy hop while the Nazis are getting ready to knock on your door. Janet Mervin’s costumes include lovely uniforms, country dresses and the quaint outfit of Katrine’s father. Lucky Gilbert Pearto’s lighting tastefully brings great loneliness and hope into the basement.